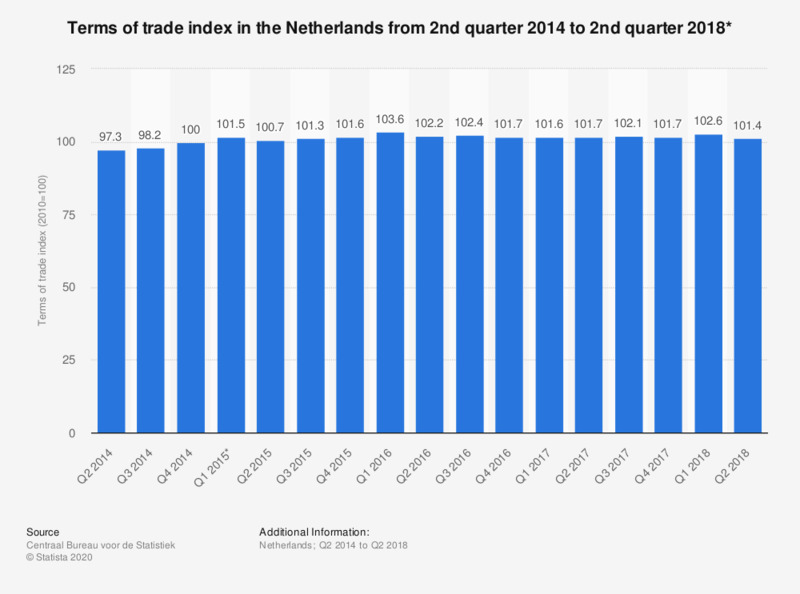 This statistic displays the terms of trade index in the Netherlands from the second quarter of 2014 to the second quarter of 2018. It shows the terms of trade increased between the second quarter of 2014 and the first quarter of 2015. In the second quarter of 2018, the trade index was 101.4. The terms of trade is the ratio between the prices of import and the prices of export. If the prices of export increase faster than the prices of import the terms of trade improve. An index compares the value of a variable (e.g. turnover) in a certain period with the value of the same variable in the base period. The index of this base period is 100. * All numbers provided from 2015 onwards are provisional.